"Hey – you – what’s that’s sound? Good music should be able to move you within a few bars – when you first hear that melody, when you make out THAT riff, when you first catch a whisper of the baseline – hearing good music should be head turning, attention grabbing, a drop-everything-and-listen-to-this moment, a moment of elation, a moment of ecstasy – a moment you hope will never end. 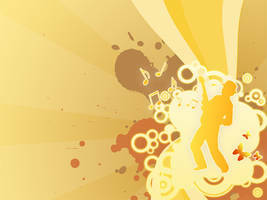 The Mercury Music Award celebrates the best of British music – my piece celebrates that celebration..."
Just purchased. This piece had me memorized for years. Thank you for creating it. It's a beautiful piece of work. Love the texture and colour in particular. Back in the days where I listened to Nujabes in which I managed to discover this magnificient jewel. This is for the memories. Love. Just thought I'd let you know I got it as a black coffee mug! I love the art piece, and can't wait to have it. The title pretty much describes a part of me. Aww brill - I hope you get good use out of it! I plan on doing so. love this pic, its just perfect! wanna get a poster of it!!! Thank you! be sure to add it to your prints wishlist in that case! love this pic, its just perfect!!!!! I just received this yesterday and now have it hanging in my house. Fantastic! Oh that is brilliant news! Its always a shame that you never hear feedback from people who've bought prints, so this pleases me greatly - if it's not too weird a request, it would be great to see a photo in situ! I'm going to paint a room and then hang it so it will be a while before I have it up. I'll share a pic once I place it. Fantastic stuff! Well I hope to see it when its finished - best of luck! i love everything about this picture i don't think it's pretentious at all! it's lovely... the perspective, the colours, the lines... thank you! we loved your work so much, we featured it on our Design Barn at [link] ! Well thank you, thats great to hear! Oh lovely - thanks for bringing it to my attention! I love all of that. ALL ^^! This is simply beautiful! It strikes me with the same feelings i get when i listen to really good music... very interesting! This is ridiculously good. I'm a huge fan... startiing... NOW! I love the colors in this. Beautiful textures. This is iconic; a very strong and well thought out composition. It has been found from the word : "BEGINNING "